Recently I met a woman struggling to decide her next career path. She was significantly older than I was, mid-50’s, and currently unemployed. To get her bachelors degree, this woman went to school full-time, worked in New York City, and made time to pick up her son from college when he needed to come home. Now as an experienced financial analyst, she is working part-time filing papers and doing little better than minimum wage. I was struck by the failure of her determined work ethic and “keep-my-head-down” kind of attitude, trying to make ends meet. In my opinion, she had worked hard and deserved better opportunities without needing to worry about relocating back to New York or planning for retirement. This one woman’s story is all too common. In the current job market, both young college graduates and middle-aged professionals find themselves in the same position– unemployed. I have friends who spend hours online, combing through job listings and tweaking cover letters, sending their career futures deep inside the Internet’s black hole. Unlike opportunities in the past, hard work and good grades just aren’t enough. Employers are looking for something more. I recent read two seemingly different books that address this problem in very similar ways. 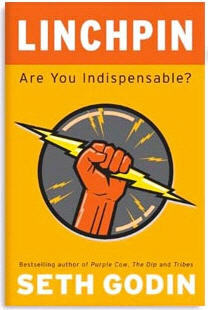 Seth Godin’s book Linchpin: Are You Indispensable, discusses the changing business market through a how-to guide toward becoming an indispensable employee in any company or career opportunity. Godin defines a linchpin as an individual who functions as an essential part of their organization or business without necessarily identifiable job responsibilities. Linchpins accomplish tasks without waiting to be asked, assigned or directed. They think outside the normal confines of “no,” “too difficult” or “status quo”. Godin reminds us that while it may appear only the smartest and the best can attain such a coveted linchpin position, every individual has the power to create and make a change. At a time when the market is obsessed with cheaper and faster, Seth Godin argues companies need more creativity and art in order for success. 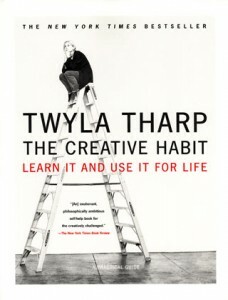 The second book is written by Twyla Tharp, titled The Creative Habit: Learn It and Use It For Life. Her how-to book explores the ways to work your creative muscles, to create and explore around the mental blocks all artists face at one time or another. Tharp approaches artistic creation from a dancer’s point of view but uses personal experiences and everyday exercises translatable in any medium of creative thought and design. Choreographing a dance is not easy and it is never easy. But the awareness of that struggle and ability to move beyond is one reason why any art (painting, engineering, carpentry) is such as essential part of the human spirit. Both Godin and Tharp share a wholehearted faith in the power of the creative mind. Creativity, unlike hard work and following the rules, is constantly evolving and requires present, complex thought. In my mind these authors’ unique philosophies present us with a challenge. Approach your current or future job as if you are an invaluable and intelligent asset; one with the knowledge and creative insight to see opportunity and make a revolutionary change. Picture how interesting your job would be. Granted, there will always be assignments and deadlines that cannot be changed. Some paperwork must be completed regardless of your insight and ingenuity. A creative linchpin, however, looks for the moments of challenge and improvisation to create something new, something the world cannot believe it has previously lived without. The world may be waiting for you. Such a difficult job market now. Good luck to the job seekers.